The 2012 Football Season did not turn out exactly as USC Quarterback Matt Barkley had expected. He could have entered the NFL Draft after his junior year of college but he chose to stick it out, get his degree and use the year to grow into the NFL. He would have been in some pretty tough competition as a rookie quarterback considering that Andrew Luck, Robert Griffin III and Russell Wilson were also just entering the NFL in 2012…..not to mention Nick Foles or Kirk Cousins who both got in their licks during their rookie seasons. 2013 might just turn out to be a better year for Barkley to give the big leagues a try. He will be highly sought after and will most likely go in the first or second round. 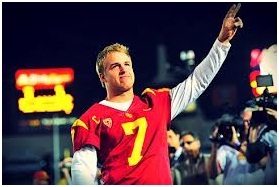 As an athlete, Matt Barkley must be pretty disappointed in how this season has turned out. He was looking forward to going out with a bang. Taking the Trojans to the National Championship Game or perhaps winning the Heisman Trophy were both pre season predictions for Barkley at USC. A lingering, painful shoulder injury kept him off the field for the seasons’ final game against Norte Dame and he will also be watching from the sidelines at the Trojans take on Georgia Tech in El Paso, Texas at the Sun Bowl on New Years’ Eve. After having been one of the most prolific passers in USC history, watching from the sidelines won’t be easy. Barkley is a born and bred Southern California native. He is a local hero and could probably have a go at being a movie star should quarterbacking not work out for him. He leaves USC holding the records for passing yards and touchdowns. Barkley went 34-13as a starter for the Trojans. He was also the first true freshman to start at quarterback at USC in 2009. USC Head Coach Lane Kiffin regretfully announced that redshirt freshman Max Wittek will start in Barkley place in the Sun Bowl. Meanwhile, speculation already abounds about the upcoming NFL Draft and just where Matt Barkley will end up. There seems to be little doubt that he will be picked up in the first or second round. The Chiefs and the Jags could both use him. Barkley needs to now turn his attention to rehabilitating his shoulder and making himself ready for the toughest test of his life.